While traveling abroad, it is not unusual to find locals who speak multiple languages. Americans, on the other hand, are often fluent in just their own. English, while frequently spoken in the hospitality industry, is not universal. Travelers might have difficulty navigating towns and cities with just a command of the English language. In France, I learned not to rely on the hotel concierge to make restaurant reservations. I had an international call plan and when checking restaurant reviews clicked on “call;” when the call was answered, I asked in French: "Parlez-vous Anglais?" (do you speak English)? They most often replied yes and I could successfully make my own dinner reservation. If they had replied no, I would have asked: "Une table pour deux, s’il vous plaît" (a table for two please). You too can brush up on a language prior to your trip. There are lots of short- and long-term options, free and for a fee. Fodors offers free information on pronunciation, greetings, directions, shopping, numbers, and dining for French, Italian, German, Arabic, Chinese, and Japanese languages. Duolingo is a free program or app that offers bite-sized lessons where you learn to read, listen, and speak, immediately seeing your results and how to improve. Available for Spanish, French, German, Italian, Russian, Portuguese, Turkish, Dutch, Irish, Danish, Swedish, Ukrainian, Esperanto, Polish, Greek, and Hungarian languages. Rosetta Stone is an immersive online program and app that claims it’s for users seeking to speak a new language (around 30 are available) in the real world. They offer an intuitive, immersive method available on a subscription-basis for three, six, twelve, and twenty-four months. 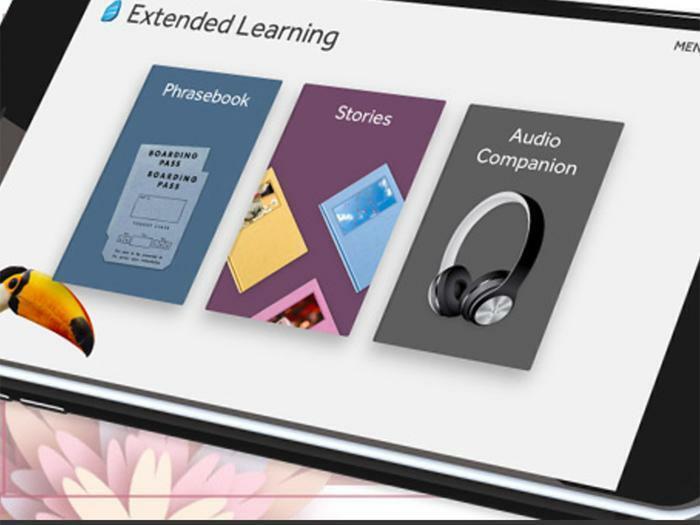 Babbel is an immersive program and app that claims to combine communicative didactics, cognitivism, behaviorism and constructivism to learn German, French, Spanish, Italian, Portuguese, Swedish, Dutch, Polish, Turkish, Indonesian, Norwegian, Danish, and Russian languages. There is a free beginner’s lesson to see if you like the method and then paid subscriptions for beginner, intermediate, grammar, listening and speaking, offered as one, three, six and twelve month subscriptions. FluentU uses realistic, cultural immersion and timed repetition to learn Chinese (Mandarin), Spanish, French, German, and Japanese languages. Users like the videos, short clips, and quiz formats. They offer a 15-day free trial and then Basic and Plus monthly subscriptions. Language classes are offered through local college, community college, or adult education/lifelong learning programs. Whatever method you choose, learning the basics will help you connect with the locals and enhance your travels overall.